This sweet British import features rhyming text slightly reminiscent of The House that Jack Built. Appealing illustrations use loose acrylics with saturated color. 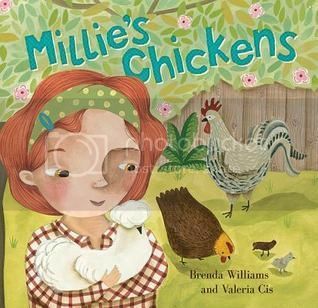 Millie's idyllic backyard is filled with plants, a slide, a clothesline and happily pecking chickens. One of Millie's hens, Silkie, gets lost, but is quickly found with a clutch of eggs, and Millie is kept contentedly busy looking after the chickens and their new baby chicks. Endpapers display an assortment of heritage breed chickens on a soft blue background. The book is appended with a colorful illustrated glossary and informative text on keeping chickens, chicken anatomy, parts of an egg and the life cycle of chickens, as well as suggestions of different cooking methods for eggs.